Concussion is a type of brain injury. It is recognised as a complex injury that is a challenge to evaluate and manage. It generally results from a knock often to the head, face or neck but may be anywhere on the body — which transmits an impulsive force to the head. It commonly involves short-lived impairment of brain function. Concussion is an evolving injury that may change over the first few hours and sometimes over a few days. In most cases symptoms have resolved by seven days post injury. It affects athletes at all levels of sport from recreational sports to the full-time sports professionals. There has been growing concern in Australia and internationally about the incidence of sport-related concussion and potential health ramifications for athletes. If managed correctly most symptoms and signs will resolve spontaneously. However, complications can occur such as prolonged duration of symptoms and increased susceptibility to further injury if not managed correctly. * Difficult to detect. The symptoms and signs can be varied, non-specific and subtle. * Athletes with suspected concussion should be removed from the game and assessed by a medical doctor. * Children and adolescents take longer to recover from concussion. A more conservative approach should be taken with those aged 18 or younger. * Medical imaging is not indicated unless there is suspicion of more serious head or brain injury. Did you know, high speed running or high kicking are some of the common reasons for a hamstring strain? It is a common condition which residents of Parramatta regularly seek treatment for. 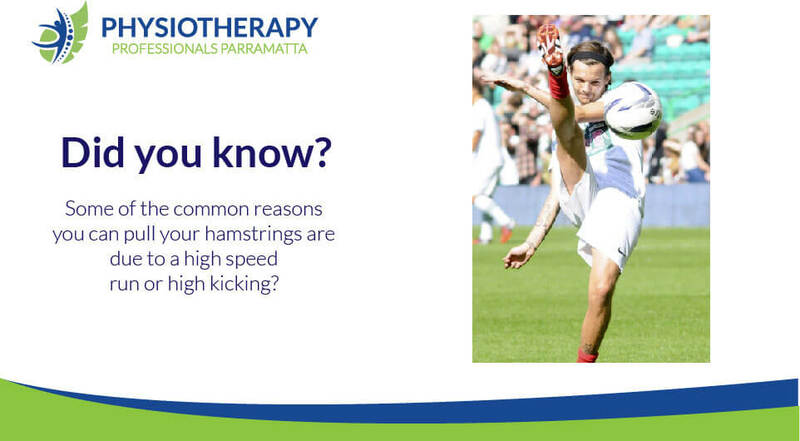 Get in touch with Physiotherapy Professionals Parramatta today for hamstring strain treatment. Located walking distance from Parramatta and Harris Park station. Appointments available 6 days a week. The knee joint contains quite a few ligaments which provide stability to the joint. 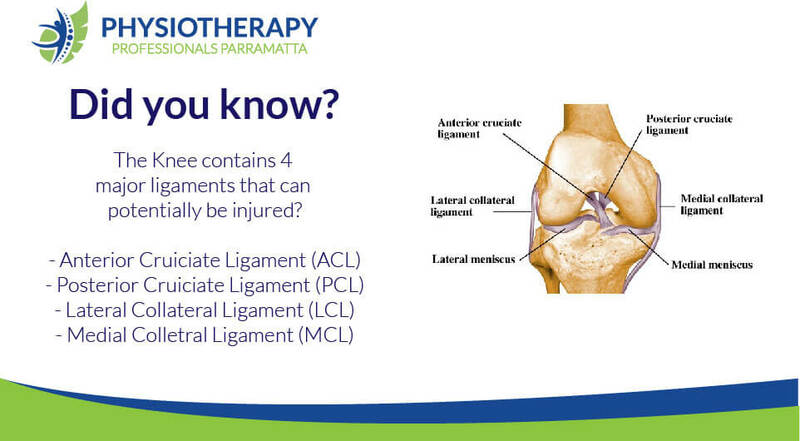 Dynamic movements or sudden unexpected movements which take place during sports can result in a knee ligament injury. Which muscle slows your running speed? Did you know, when you are running or jogging one of the many jobs of the hamstring muscle is to reduce your running speed? 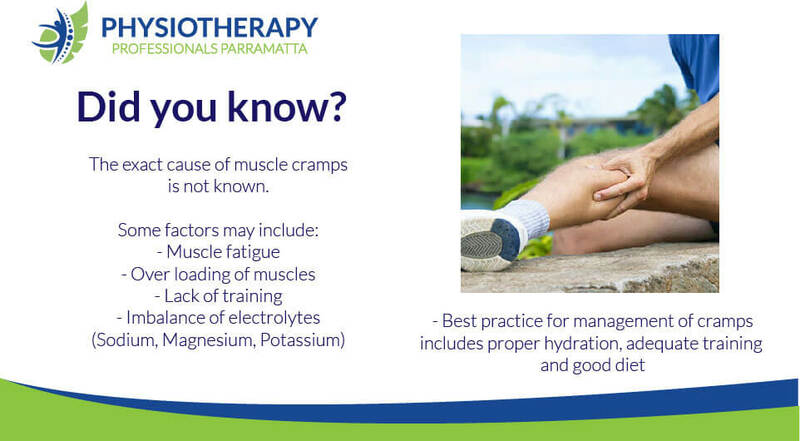 Muscle cramps are strong and can be very painful muscle contractions. These are usually involuntary contractions. We have no control over them. There are multiple theories about why we get cramps, but the scientific world is still trying to figure out this mystery. There are a variety of types and causes of cramps. Cramps which occur during exercise, at rest, or at night, depending upon the exact cause. Dehydration is a common cause of cramps. Most cramps can be stopped if the muscle can be stretched. In the mean time, if you do suffer from cramps, make sure you keep yourself well hydrated with the correct levels of electrolytes, avoid over training and give your body plenty of breaks in between training sessions. Have you sustained a sports injury? Get in touch with us and see how we can help you! 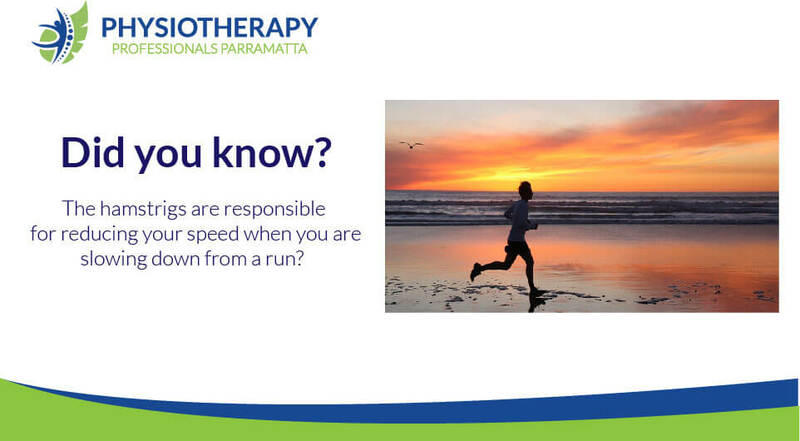 Physiotherapy Professionals Parramatta, now providing sports injury treatment in Parramatta and surrounding suburbs. 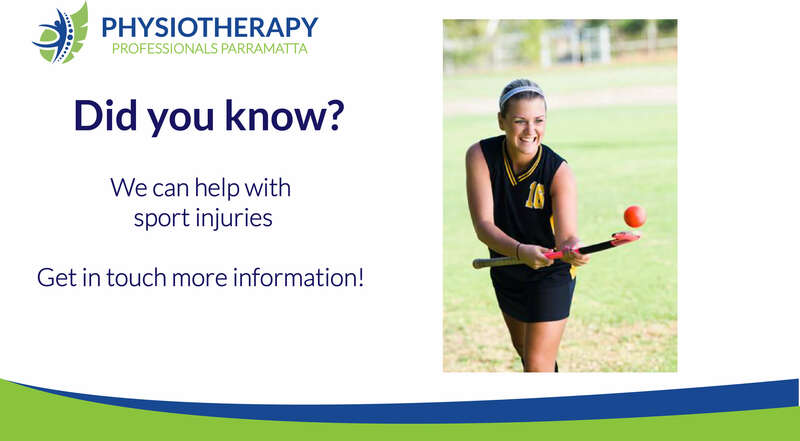 If you are struggling from a sports injury, get in touch with Physiotherapy Professionals Parramatta today. Located walking distance from Parramatta and Harris Park station. Appointments available 6 days a week.